1. Mix all the marinade ingredients. 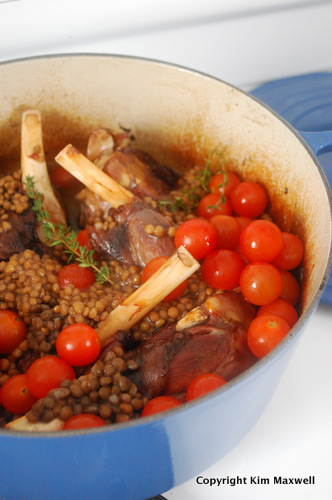 Place the lamb shanks in a large round casserole dish. Pour over the shanks and refrigerate overnight. 2. Preheat the oven to 160 degrees Celcius. 3. Slow-roast the shanks for four hours, turning occasionally so the marinade covers more meat. 4. 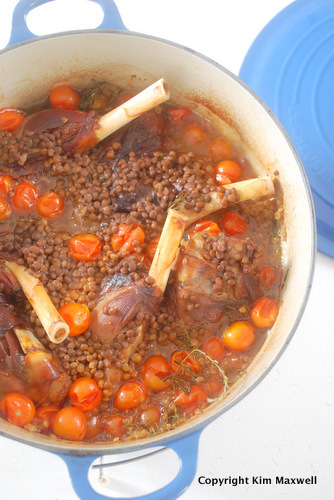 Remove the chilli and add the lentils, thyme sprigs and tinned tomatoes. The photo here shows what the dish should look like after four hours. Taste the sauce, add salt and more black pepper. 5. Cook for another 45 to 60 minutes, remove the lid to reduce if the sauce requires thickening. Serve with couscous or mashed potato.